We have been successfully shipping roses throughout the United States for over 25 years. We continue to receive compliments on our well designed packaging and the speed at which our orders are dispatched. With this program, we ship our 2-gallon, wholesale roses in a specially designed box via FED EX to your business. Pricing varies, depending on your location. Please call our office at 979-836-3950 for your regional pricing or request a welcome packet via mail using the request form on our home page. Prices are all-inclusive and cover the wholesale cost of the rose, shipping, and handling. All paperwork for establishing you as a wholesale customer must be received by ARE. 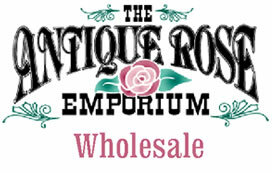 Claims will be reviewed by the Antique Rose Emporium, with photos of your shipment being required. To make a claim, please include pictures of the roses and the packaging, as well as a copy of your packing slip. All claims must be made within 72 hours of receipt of shipment. Claims will be handled on an individual basis. Please be aware that our Shipped to You Program roses are cut back and in some cases stripped of foliage, depending on the time of year as well as the agricultural protocol for the following states: CA, WA, AZ, NV, UT, and ID. Because of this, please allow 2 to 3 weeks for roses to leaf out and to be sales ready.